Eating is a sensory experience. The smell, look, feel, touch, and even sound can all affect the taste. So, what should you expect when eating our Red Sun Farms Produce? This summer we are going to take you on a walk through the flavor profiles of our favorite items. Let’s get the party started with Tomatoes! The flavor of tomatoes at any ripeness is an elegant balance between the acidity of the tomato and the sweetness of the tomato (determined by ripeness & seed variety). The aroma of the tomato when cut, can also affect the taste of tomatoes, making it a true partnership between taste and smell. Heirloom Tomatoes: These tomatoes are what one may describe as the most delicate of flavors, as their flavor profiles are greatly affected by the climate and growing conditions. However, lucky for us we grow them in our own controlled greenhouse environments. Red Heirloom tomatoes have a classic/ old fashioned tomato flavor, which means the acid and sugar are balanced within the tomato, reminiscent of what you may find at an open-air farmers market in the peak of the season. The flavor is robust with a juicy skin. They are perfect for sandwiches, burgers, and dishes like our Heirloom Tomato Tart. Cocoa Tomatoes: These “chocolate” tomatoes are more of an earthy, savory or broth like flavor. A succulent tomato with origins from Western Europe, and color evolutions that just improve the flavor and eating experience at each stage in the ripening process – you decide which stage you like best. The greener fruit will possess a stronger, more robust flavor while waiting for the fruit to ripen to a full brown would result in a “sweeter” eating experience. We suggest pairing them in dishes that are known for their acidity. Scarlet Pearl Tomatoes: These little red grape tomatoes are packed with robust sweet flavor, containing a meatier and less watery skin. Scarlet Pearls are the most common and likely plentiful in your grocery store, their skin aids in durability during distribution and transport. They are the perfect mini tomato for snacking and lunches. Try them yourself in recipes like in our Baja Breakfast Burrito. If red grape tomatoes are on the sweeter side for you try our orange variety, Monarch Pearls which have a tangier flavor; a little milder but with a nice crunch, great for the kids. Cherry Tomatoes on the Vine: Are one of the sweetest of the tomato varieties, they ripen on the vine so be sure to leave them on until you are ready to eat them. These extremely versatile tomatoes are sweet and tangy adding a brilliant pop of color to any dish. Try them in our Spicy Tomato Blaster Smoothie for a new twist. Our final tomato feature of the day is our coveted Chef’s Collection. We like to call the party mix of tomatoes for the family, every pint will have something for any tomato lover in the family. 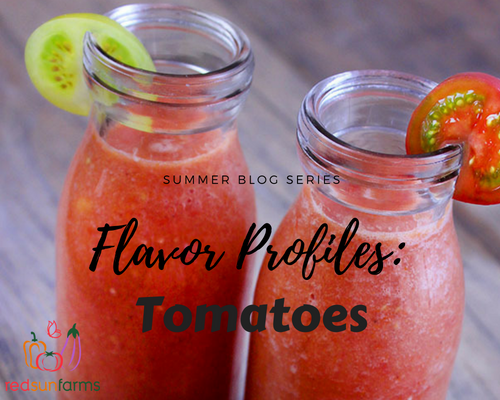 This mixture includes the newest varieties of tomatoes offering in an array of different taste profiles from sweet to savory, all at once or individually – depending on how you eat your tomatoes. Try them in an appetizer like our Tomato, Mozzerella Skewers with Pesto for an added “wow factor” at your next get together. In any one pint you’ll come out with a mixture of brilliant reds and oranges, to muted, reds, oranges and yellow, and don’t forget about the cocoa’s that are found throughout; we love just grabbing a handful and munching away. For more about these varieties and the other varieties of tomatoes we carry, visit Our Vegetables page. Follow our recipes page and social media for any new and fun recipes to try with Red Sun Farms produce.